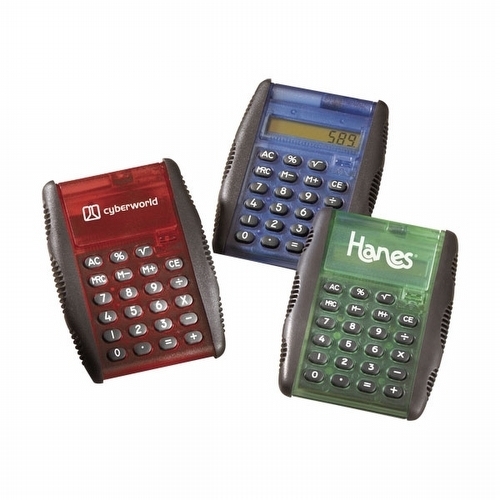 Promotional calculators featuring your corporate logo are sure to tally up impressions from customers while also providing them with a handy tool that they can use every day. A small custom calculator is perfect for someone who is always running around the office and a desk calculator is a wonderful gift for your favorite number cruncher. Whether you're ordering some personalized calculators as corporate gifts or as giveaway items for a tradeshow, Panda Apparel & Imprinting has the calculator for you. The minimum for this product starts at 100 pieces and basic pricing starts at about $2.50 each! Of course the more you purchase the lower the price! Contact us for a quote!